If you're planning a vacation to Florianopolis Brazil or just looking for a nice place to stay, then look no further! 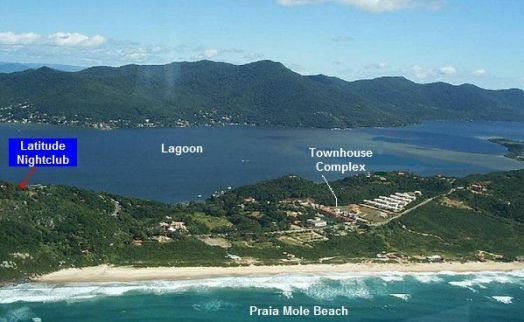 My name is Don and I'm an American who owns a very nice vacation rental on one of the best beaches in Florianopolis Brazil, a beach called Praia Mole (pronounced Prya Moley). Please contact me for availability. 1. You're going to have the time of your life! 3. Location is absolutely EVERYTHING, especially in high season! When searching for a Florianopolis vacation rental in Brazil, your location is very critical, especially in high season when afternoon beach traffic comes to a standstill from 2-9 pm every day. This is caused by the thousands of beachgoers attempting to leave the beach at approximately the same time on the tiny two-lane roads (1 lane in each direction). The only way to avoid this traffic is to get yourself a nice Florianopolis vacation home that is within walking distance to the beach, preferably a beach named Praia Mole. My Praia Mole beach house is located on a narrow strip of land (about 300 yards wide) sandwiched between Praia Mole beach and a large salt-water lagoon (see photo below). We call this area the "Filet Mignon" of Florianopolis due to its extremely beautiful, convenient, and desirable location year-round. As the golden rule of real estate goes, location is everything. To put this location into perspective, the average townhouse in our complex sells for 2-3 times the same house would cost just a few blocks in either direction. Why? Because Praia Mole beach is a crescent-shaped beach with small mountains at each end. If you go more than 2 blocks in either direction, you're no longer within a comfortable walking distance of the beach, unless you enjoy trekking over mountains in 95 degree heat with 95% humidity. My vacation house is located in a townhouse complex directly across from Praia Mole beach, just a 3 to 5 minute walk from door to sand. On the opposite side of the housing complex is the most beautiful part of the giant lagoon visible in the photo directly above. The photo at the very top of this page (with the large granite rocks protruding from the water) was taken by me from the dock directly behind our complex, just a 5-minute walk on the nature trail through the jungle. This is an incredibly beautiful and peaceful area for swimming and sunbathing, usually with nobody around. Additional benefits of Praia Mole beach are the convenient distance of nightlife, shopping malls, grocery stores, bars, restaurants, and gyms all within a 5-20 minute drive. 75% of Florianopolis nightlife is within a 5-10 minute drive of the house, with one nightclub (Latitude) just a 5 minute walk away. The rest of the nightlife is in the town of Centro (a 25-min drive) with 2 nightclubs on the north end of the island (a 40-min drive). However, the nightclubs on the north end of the island only open during the peak of high season (mid Dec - Feb), as the area becomes a ghost town outside the peak of high season. For a better visual, take a look at this Florianopolis Map. Florianopolis (often called Floripa) is the capital of Santa Catarina, a large state in south Brazil. 90% of Florianopolis city resides on a large island (about 22 miles long and 4 miles wide) connected to the mainland by a bridge. Florianopolis Island has 42 different beaches and several beautiful large lagoons (or salt water lakes open to the sea). The largest lagoon is located just behind our housing complex. In this lagoon, you can take a guided boat tour to the far end where there is a small fishing village with no roads in or out. The only access is by boat. Once there, you can have an authentic Brazilian style fish lunch on the water, trek through the jungle to a waterfall, or just go for a swim in the glassy waters of the lagoon. To see larger photos of my Praia Mole Vacation home, please visit my Praia Mole Accommodations page. For photos of surrounding beaches and nightlife, contact me and I'll send you lots more photos. If you're interest in renting my Florianopolis Vacation Home, please call me at the number below or contact me through my contact form. I will get back to you ASAP with a quote and availability. Life is short - Take a Florianopolis Vacation You'll Never Forget - on Praia Mole Beach!